The uncomfortable truth about social networking is that it can take a huge amount of work to keep on top of the flood of news that it creates. Socialite (previously known as EventBox before its acquisition by Realmac Software) lets you add a bunch of services, and view/interact with them in one place rather than having to visit different sites or use a slew of single-function apps. It supports Twitter, Facebook, Flickr, Digg and both straight RSS feeds and synchronisation with the Google Reader RSS service. Perhaps the most significant enhancement made to EventBox by the Realmac Software team is the support for multiple accounts. It's now easy to add, say, a work and a professional Twitter identity, and post from either. However, the program doesn't allow TweetDeck-like abilities to post to multiple accounts plus Facebook all at once. Just as important for Twitter addicts is the support both for Lists (which make it easier to stream your tweets in a more manageable way) and for the new Retweet feature. The Facebook accounts are limited to status updates and photos – a blessing frankly; we're spared FarmVille notifications – though you can also read and write comments on status updates. For photos uploaded by your friends through both Facebook and Flickr, you can click an icon to view larger versions in a popup window right within Socialite. Indeed, though the interface looks spare, you can actually do a lot with each entry. A cluster of icons beside each Event lets you perform various actions on it, depending on what kind of entry it is. Favourite it, reply to it, add it to Instapaper, tweet it with one of your Twitter accounts, and more. Useful touches abound, though it might take you a while to find them. Shortened URLs can be expanded automatically, which is great for scanning your feeds; seeing the real URL can be a good indication as to whether you want to bother loading it. It also supports authentication for a bunch of shortening services, so you can track who clicks on links that you shorten. We love the keyboard shortcuts that let you quickly flick through your Events and enable you to load links up in a browser in the background for later viewing. Having everything in one app is undoubtedly convenient, but there are some fundamental problems. The biggest is duplication; if you follow the same person with more than one account on Twitter – and, worse, if they push all their tweets to Facebook – you'll see the same update multiple times. As well as these problems, there are other omissions – you can't really post between one Twitter account and another, you can't comment on Digg stories, and some features, such as the ability to upload photos, are hard to find. 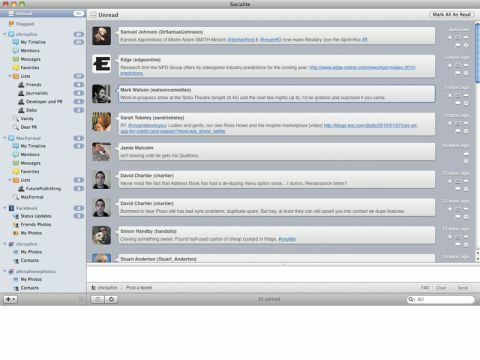 But despite the niggles, Socialite is a competent, useful app.